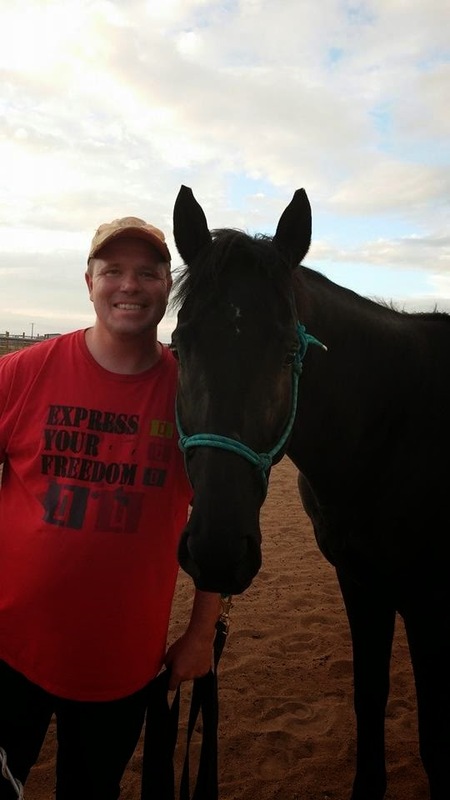 Early on in my equine-assisted work, the horses showed me that they wanted me to partner with them on energetic levels, healing the underlying energetic blocks in the body that came from the emotional wounds and resulting cognitive & behavioral patterns that people carry from their less than ideal childhoods. It's been a remarkable journey of learning to uncover ways to support this process between horses and humans. "Jenn, your horses seem different than ones I've been around before. Are ALL horses energy healers?" I discovered that this is an important and fabulous question!!!! At first, I thought the answer was yes, because all of the horses I had worked with were interested and capable of helping humans shift the energetic blocks of the underlying patterns. They had been busy showing me HOW they were able to do this. But now, I realize the answer is the very same answer I would give if you asked me the same question about people: "Jenn, is everyone an energy healer?" 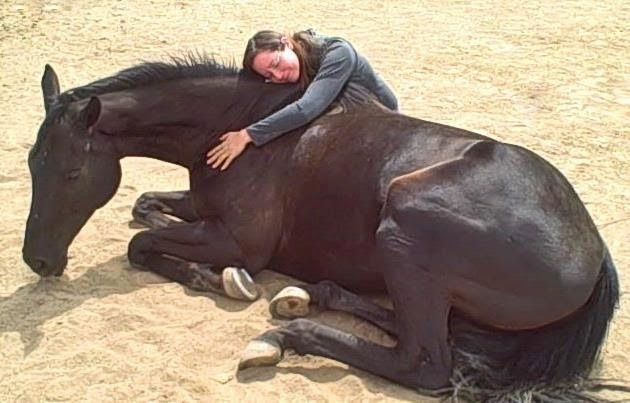 Yes, all horses and humans CAN be energy healers, if they so choose. We all have the innate capability to work on that level, because we are all spiritual beings having an earthly experience. Some horses and humans are naturally gifted at this type of work. BUT, not every horse or human is currently interested in being an energy healer. Some of them have simply forgotten that it's something they can do and happily remember once they are around it again. And some really DON'T want to be involved in helping others heal or shift energies! Sometimes the lack of interest is temporary, because the horse or human is still resolving their own traumas and really are not willing or ready to help someone else process their issues. "Please don't make me work with people with painful emotions!" Many of these horses, once healed from within, become interested in helping humans and they then often resonate with people who've gone through similar issues, making a wodnerful "Wounded Healer". But some of these horses (and people too!) may NEVER decide they want to help others heal, and its our job to respect this choice. What's interesting here is really about knowing your own horses and learning how they WANT to contribute. Many horses are happy to help through some of the more "activity" based processes, whereas, others want to go deeper and work with deep emotional and energetic issues. In the equine-assisted community, there is a place for all types of these different ways of being with the horses for healing- because the horses themselves all have different healing gifts and preferences for helping humans. And it's important that we respect that about each and every horse we partner with. And of course, the preferences of our horses can change over time, and so it's important to keep checking in with them about how they wish to participate! I'd love to share with you the journey of Galaxy, because he exemplifies a horse who had to go on his own journey of healing before he remembered he was interested in offering healing to others! Galaxy, a GORGEOUS, 5 yo, 17 hand TB gelding came to our farm 2 years ago straight from the race track. We spent about a month engaging in heart-felt connection type activities, inviting him into a new space of BEING together, without being defined by DOING things FOR US, like is typical at the race track. Being open to new things and incredibly friendly, he easily took to this new way of relating with humans, and it was very rewarding to experience. Then, he got a very nasty hock injury/infection, which took about 4 months of daily handling to heal. What a wonderful way to experience the care of healing! HA! After that, it turned out he wasn't sound in lots of other areas in his body. Plus, being accident-prone, he was constantly adding new injuries to his healing list! While sometimes frustrating (and expensive!) from the human perspective, all this time, more than a year, Galaxy was on his own healing journey, discovering what it is like to have people care for and about him, in a whole new way, just having the chance to BE together. During this time, Galaxy was also an ardent student, he LOVED to watch the other horses offer energy healing to humans. He'd stand and observe the entire time, remembering this skill and ability that horses and humans have together. And yet, he wasn't quite ready yet, to step in and participate, he had more healing of his own to do. Then one day, he was ready and it was a beautiful sight to see. So I suggested that Greg go out to the herd and see who wanted to help him. I figured it would be one of our veterans, eager to assist with deep energy work. But guess who volunteered? Newbie healer, Galaxy, stepped forward! And for the first time ever, Galaxy engaged in a full-on, wholly energetic healing session for Greg. In fact, he did it 2 days in a row, for about 20 minutes each, no halter, no ropes, just pure volunteered, energy healing, no talking or coaching involved. If you had been watching you would have seen Greg simply standing there, as Galaxy proceeded to lick the energy off of him. Galaxy most loved licking Greg's hands, over and over, stopping only to lick and chew, yawn, and shake his neck, repeatedly, as he shifted the incongruent energy from Greg's field. Sometimes, Galaxy would move around Greg and nip some energy off of a shoulder, the heart chakra, or the back. Being new to this line of work, Galaxy sometimes needed a gentle reminder that an actual nip wasn't welcome, but an energetic nipping of the energy was good work! We knew the healing was done, when Galaxy gently sauntered off to nibble some remaining hay. 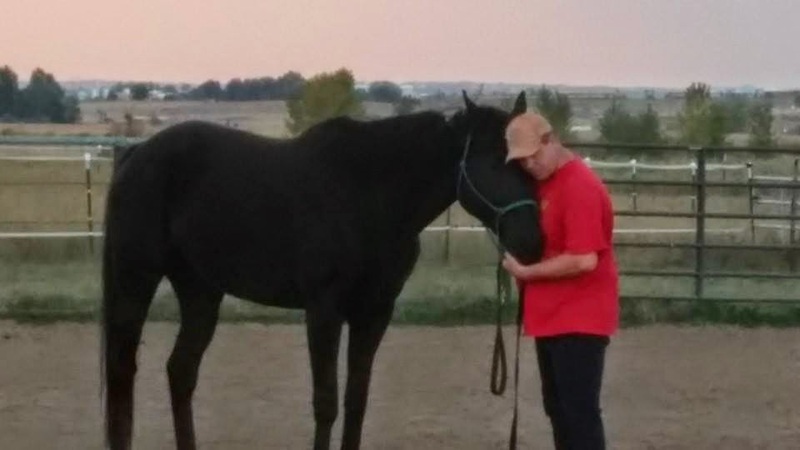 Greg and Galaxy have a wonderful connection and so it was such a delight to see this amazing gelding step forward, and having remembered how horses can help humans, offer to help his friend Greg heal from a trauma. It was a sign that Galaxy had now entered a new stage on his own healing journey! Part of the beauty of this work, is that there is healing available for everyone, both horse and human, off and on, during the process. Who is ready for what and what wants to happen now, these are excellent questions to tune into on any given day with the herd! What have you noticed about horses learning to heal? Do you have horses who prefer energy healing or activity healing? What have you noticed??? A story for another time! One summer I watched the head of our Healing Herd, 22 yo matriarch, Serendipity, train her daughter Frolic to be a more effective healer and now they work as a tag-team, healing duo!